I was there when the floods started. At the time it was not clear that floods were on the way. Where I was fishing, I got a firsthand look at what a Colorado cloudburst could do, not in the same way that we would see destruction over the next few days of course but still pretty impressive. The forecast called for a chance of rain, but as the day wore on the clouds thinned. As a good fisherman I hoped that the clouds would return. When I arrived at South Boulder Creek at Walker Ranch, the sky was again starting to lower. Off to the south it was darker and more threatening. Perfect fishing weather. It was Tuesday evening, September 10, 2013. 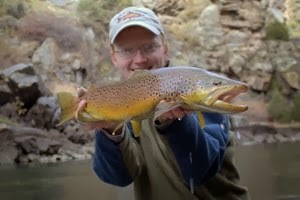 On the creek, I was surprised when streamers did not give me any results. 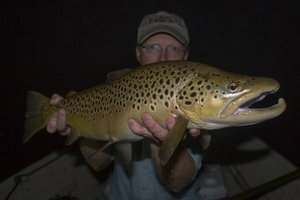 We are quickly approaching fall and the brown trout should be aggressive now or soon. Fish were rising though. It started to drizzle. Quickly I changed leaders and added some 6x tippet. BWO weather. I dug out my box of dries and scrounged around in the one compartment where I keep my small patterns. 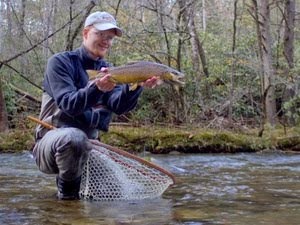 A few #20 BWO Sparkle Duns were there from my tying spree last fall that came as a result of a fantastic experience fishing the little dries on Clear Creek. By now the drizzle was falling harder. Adding floatant was a challenge. 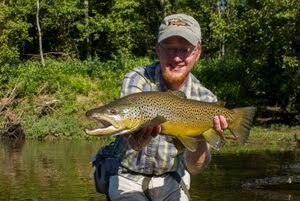 I leaned forward to protect the dry fly with my hat brim and body as I rubbed the Aquel into the body of the little fly. Pulling out a bottle of Frogs Fanny, I put it conveniently into my pocket. I would need a lot to keep that fly afloat. Finding one of the best pools empty, I quickly moved in. Rain was steady and my camera bag was getting wet. Looking around, I noticed a small boulder with an overhang under a bush. I shoved the camera bag underneath the overhang and hoped it would stay dry enough. Fish were almost causing the water to boil with rises by now. Every once in a while a larger mayfly would make an appearance as it labored upstream just above the water, all the while getting pelted with raindrops...or was it dodging them? I settled into a nice rhythm. Cast, cast, set, land fish, release, repeat. Some nicer rainbows started mixing into the catch. The little rainbows looked a lot like the little 'bows I used to catch in the Smoky Mountains of Tennessee. It was raining, making it feel even more like home. I could get used to this. A gully washer moved in, pelting the water so hard that every 3 or 4 casts I was applying Frogs Fanny with the same procedure as the original floatant. Still the fish were eating. A guy from somewhere back east came down the canyon as he headed for the bridge and a quick hike out. We chatted in the pouring rain and then he continued on his soggy way. Even with my rain coat on I was getting drenched. What a day to wet wade. Yet another wallet drying experience loomed in my immediate future. I checked under the rock to see how my camera was doing. The bag was pretty damp. Maybe it's time to hike out. Fish were still rising though so I kept fishing. The runoff hit the stream pretty hard just a couple of fish later. I noticed the murky torrent along the edge of the clear water. With the dam just upstream, I felt fairly safe from flash floods. The road was another story though. I've been bogged down in mud before and didn't want a repeat performance. Hiking upstream, the real mud hit. I had left at just the right time. The fish were still biting but the clarity would have changed that inside of 2 minutes. Despite the wet conditions, the rain nearly stopped as I hiked out. I was still soaking in the experience, literally and figuratively I might add. 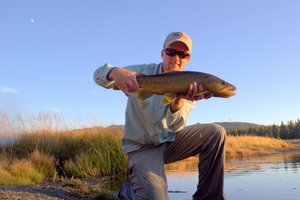 The fishing experience was one of the best I've had since moving to Colorado, and it had been too wet to photograph any of it. Apparently leaving your camera safely under a rock to keep dry is as good as leaving it at home to guarantee a great time of fishing. That night, I reflected on the amazing trip I had just had. With growing concern I noted that the rain was continuing and forecast to become heavy the next day. I still had no idea what that would actually mean though. I don't mind the rain as long as it's warm. Once it's around 40 I hate it. The worst is the drizzle with wind that just cuts through you. I'm always like just snow already. I'd rather be cold and it's snowing. Nice post David. I would have wimped out much earlier. But then again, I know what came happen in the foothills and it can happen fast. Sounds like a day to put in the scrapbook. Howard, next time I'll probably end up being a little more cautious now that I've witnessed what water can do in these hills. I was definitely blessed to have had a good trip and make it out safely.